I’m also trying to get my setup working, but not having great results with myGTX 1070ti and a Samsung CF791. Connected through DisplayPort and set to 100Hz, the control panel lets me enable G-Sync but when I try the pendulum demo the screen looses signal until I hit Esc to quit the demo. Anyone managed to get it working with the CF791? It doesn’t matter if I set FreeSync in the OSD to Standard Engine or Ultimate Engine. I upgraded recently to the 1070Ti from an R9 Fury, but the smoother experience on the R9 Fury was much better than the 1070ti. I have two Pixio New PX277s connected to the same RTX 2070 and have experienced some rare flickering issues. Half the screen likes to flicker to a lighter color or slight pink, especially on the secondary monitor when I enter/exit a game. It’s quite a rare occurrence so far, but if it happens again I’ll try and get a video of it. I suspect it’s more to do with having multiple displays, but the issue hasn’t come up often enough for me to pinpoint exactly why. I’ve got an ASUS MG279Q and an MSI Gaming X GTX 1080, and for some reason I can’t get NVIDIA Control Panel to show me that “Set Up G-SYNC” option under Display settings. I keep all my drivers up to date, I’m running over DisplayPort 1.2, and I haven’t really had any issues with monitor performance per-se (CRU, Windows, Nvidia Control panel all agree I’m at 2560x1440 @144Hz)… its just I want to set up G-SYNC and see if it helps at all. If anyone has this monitor and has been able to enable G-SYNC set up let me know what you did. Maybe I missed something along the way. Well I’m happy to report back that it does make quite a difference. Thanks Wendell! Not a Korean panel, but maybe interesting to some. MSI Optix MAG27CQ - flickering in menus but not during gameplay. And black screen for a split second when watching Youtube or other video content in Chrome. So half usable. Hope they improve something with future driver releases. Using Fast sync for now. Will try to test my Wasabi Mango UHD400 when I can. That’s because you’re at the low end of the Freesync range. 48hz at the low end is the lowest I would go for the low end of the range. 40 and 30 are too low and would result in flicker. 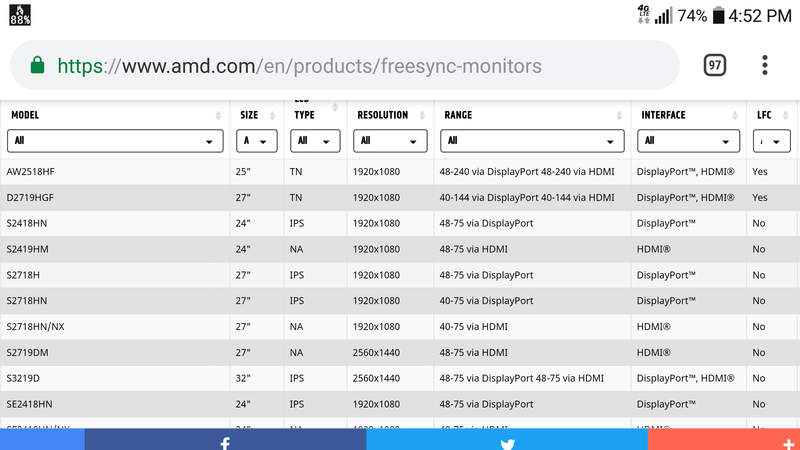 48-144 is the optimum range for FreeSync. Black screen requires turning off and on the monitor and/or disabling the audio controller on the GPU. Yes, it isn’t optimal, but that’s how it goes for now. Keep in mind frame times will affect how much the display “flickers” because inconsistent frame times result in abrupt jumps and dives in the refresh rate causing the flicker that NVIDIA tries to blame on actual FreeSync technology. I’m using DP 1.2. I guess DP 1.4 might be needed so I grabbed one off of newegg. There’s no in screen setting and it doesn’t show up on the nvidia control panel. DP 1.4 cable makes no difference either. On the AMD Freesync website is says it supports Freesync through display port and HDMI. of course for nVIDIA cards to work it has to be through display port. It could just be one of those monitors that doesn’t want to play nice.